A four-minute pitch and a subsequent discussion with the audience under the hosting of Roelof Hemmen. 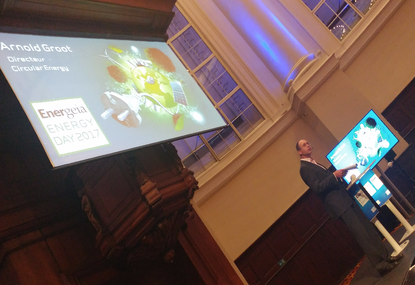 That was the opportunity offered to Circular Energy as one of three selected startups during the Energeia Energy Day on 15 June in Amsterdam. CEO Arnold Groot presented the newly patented concept of Circular Energy and answered questions about, among other things, CO2 prices, electricity, CO2 storage and the occurrence of soil movements. On 15 June, Energeia News also published a dedicated article to the company named "Start-up strives for CO2 free flow from offshore natural gas".